Neil Patrick Harris & David Burtka Play At The Park With Their Twins! 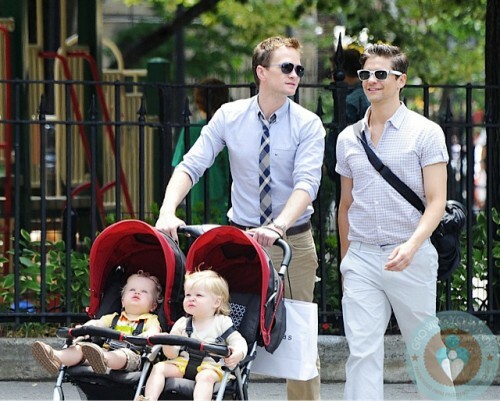 Home » Neil Patrick Harris & David Burtka Play At The Park With Their Twins! Actor Neil Patrick Harris was photographed enjoying a sunny Sunday at the park in the Big Apple with his partner David Burtka and twins Harper and Gideon. The couple, who have been together for 7 years, welcomed the twins via a surrogate in October 2010. In an interview that airs today Neil opened up to Oprah about the struggles he had in bonding emotionally with his twins during the first months of their lives. “[The surrogate] was more like the oven. Two eggs, two embryos, one of mine, one of his,” Burtka replied, pointing at Harris. The couple knew the surrogate, but the egg donor was anonymous. Through some incredible miracle both embryos took and the pair welcomed twins. The excitement, however, quickly wore off when Neil started to struggle with his role as a dad. David said he is the more “maternal” parent. Neil told Oprah he “didn’t love” the “first six, nine months” of fatherhood. For their day out at the park the two dads divided and conquered. David stayed with Gideon, while Neil ran around after a busy Harper. The twins were cute in matching yellow outfits, while strolling through the city. The family is in NYC while Neil prepares to host the Tony Awards on June 10. Padma Lakshmi and her daughter Krishna Set Off For A Polo Match!